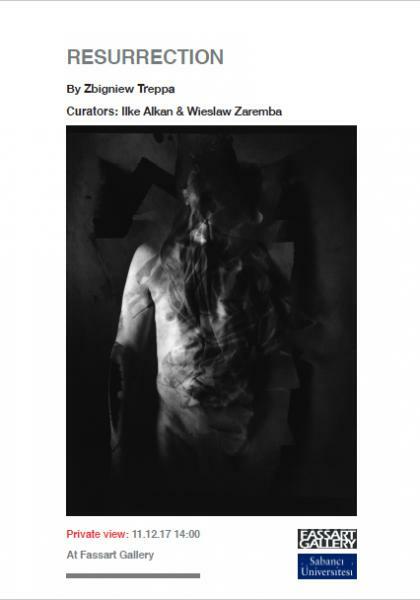 ‘Ressurrectionʼ is the exhibition that consists of eight works from the project of Zbigniew Treppa. The project is named "I believe in the resurrection of the body" and the basic creative principle for the project is that photography cannot manage without light. However, in photography, the light should not be conceived only in terms of the phenomenon forming the mood of an image or describing portrayed motifs. Light is connected to photography closer than to other visual media. This phenomenon, in fact, underlies the structural quality of photography. Light calls into existence the photographic image, but also when we no longer control it – it destroys the image. This is referred to by concepts such as "overexposure" and "flare", which in the days of the expansion of digital photography are slowly out of use in speech and cease to mean what they used to mean in the time of silver photography. But that same light, which brought the image into existence also destroys it in a natural way, with the passing of time, causing the withdrawal of the image from the surface on which it was recorded. There is another "light-creative" or "light-destructive" aspect which is one of the forgotten means of expression in photography. This is the function of light causing inversion when the exposed photosensitive material is once again exposed or is, actually, flared. That which was previously in the image shown in bright or dark tones, turns into a negative image of the original. The set of works "I believe in the resurrection of the body" is the result of searching for the form by implementing the consequences of the possibilities inherent in the photosensitive photographic material. Light is not only the driving force and the photography material, but also the condition of its symbolic aspect. Articulating the symbolism and its coming into existence is possible for him through a combination of traditional methods of creating an image and the method of inversion. That makes the area of his creative search, both formal and symbolic, situated at the meeting point of two realities: negative and positive. The above search is included in the main method of his work, which is staging. On the one hand, therefore, the fundamental problem of my symbolic and metaphorical staging is the morphology of a photo-image, and on the other, the meanings considered in the context of the substantiality of light in the transcendent aspect, and The Light as a personal, omnipotent driving force, capable of restoring a man to life after the biological death in the transfigured body, no longer subjected to suffering and death (Revelation of St. John 21: 4).